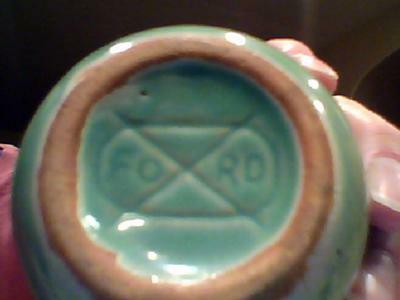 Pottery mark - 'Ford' inside oval with a cross like an 'x':- I picked this up in Minneapolis about 25 years ago. I just found it again packed away with some pottery. I would love to find out anything about this pottery. I still can't find anything about it. I have two small teapots with the same mark and can't find out anything about them. Since we are on opposite coasts, it doesn't seem likely this would be a local potter. Does anyone have information? I just bought a pretty green teapot with the same marking on the bottom. I have not been able to identify the maker either. Sure hope someone out there knows! I have a barrell-shaped, pink cookie jar that my grandmother gave to me. I have been looking for information on this mark for a while. I would also like to know more about the mark and its origin. I have one as well. 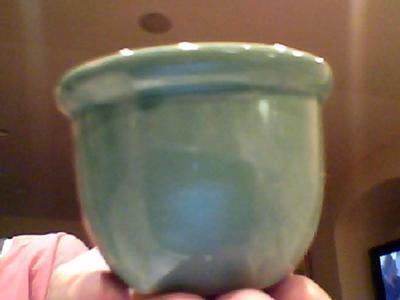 ITs a brown glazed cream pot (i think)with lid -same exact mark. Did anyone find anything? I search high and low and finally found the answer to this question - it is not Ford - it is Oxford. 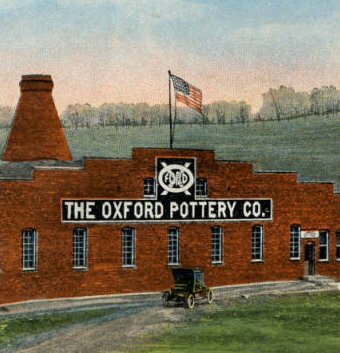 "The Oxford Pottery Company, located at Marquand and Burgess Avenues in Cambridge Ohio was founded in 1913. It produced earthenware and utility ware. In the 1920s A. O. C. Ahrendts acquired most of the stock. In 1934 the company took the name Universal Potteries. It continued to manufacture semi-vitreous dinnerware, kitchenware, and specialty ware. The company ceased producing these wares in 1954 and turned to tile manufacturing. In 1960, the name was changed to the Oxford Tile Company, Division of Universal Potteries. The plant closed in 1976." Thank you for the information. You have solved a mystery! Scott, you are my hero! I was just looking for the background on a yellow casserole baker and stumbled upon your research. Thank you for taking the time and helping the rest of us out! My Great Grandmother must have loved this pottery as I have many pieces and have searched for the Ford company while Oxford was staring me right in the face. Thanks Scott for sharing your information. Don't think I would have ever figured this out.